4. By itself ratio analysis is of little value; the user must have something to which it can be compared, such as a past value for the same company, a comparison with other companies in the same industry, or industry averages. Ratios should be used as ‘‘warning lights’’ to indicate potential problems arising in a company. They indicate the symptom, not necessarily the disease, and need to be used in conjunction with other information to enable the analyst to come up with a firm conclusion about the company. The comparative income statement given above shows that there has been an decrease in net sales of 12.30%. The cost of goods sold has decreased by 11.08%. This has resulted in decrease of gross profit by 17.10%. Administrative expenses have increased by 1.91% and marketing and selling expenses have decreased by 26.61% and financial expenses have decreased by 28.59%,nonoperating income has increased by 1093.58% and contribution to WPPF and WF has decreased by 26.14% .The decrease in gross profit is insufficient to cover the operating expenses. There is also an decrease in net profit after tax of Tk. ( 81,007,523) i.e. 80.87%. It is concluded from the above analysis that there is not good progress in the performance of the company and the overall profitability of the company is not satisfactory. The comparative income statement given above shows that there has been an decrease in net sales of 3.519%. The cost of goods sold has decreased by 4.723%. This has resulted in slightly increase of gross profit by 2.064%. Administrative expenses have decreased by 5.608% and marketing and selling expenses have decreased by 17.818% and financial expenses have decreased by 8.665%,nonoperating income has increased by 75.163% and contribution to WPPF and WF has decreased by 56.956% .The increase in gross profit is sufficient to cover the operating expenses. There is also an increase in net profit after tax of Tk14,454,519 i.e. 56.111%. It is concluded from the above analysis that there is high progress in the performance of the company and the overall profitability of the company is highly satisfactory. The comparative income statement given above shows that there has been an increase in net sales of 17.060%. The cost of goods sold has increased by 11.340%. This has resulted in high increase of gross profit by 34.475%. It is concluded from the above analysis that there is high progress in the performance of the company and the overall profitability of the company is satisfactory. The comparative income statement given above shows that there has been an increase in net sales of 76.847%. The cost of goods sold has increased by 70.405%. This has resulted in high increase of gross profit by 95.129%. It is concluded from the above analysis that there is very high progress in the performance of the company and the overall profitability of the company is highly satisfactory. 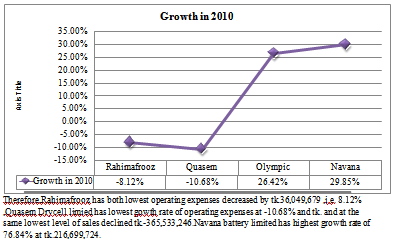 Therefore,Rahimafrooz has both lowest gowth rate of -12.3% and at the same lowest level of sales declined tk.-365,533,246.On the other hand,Navana battery limited has highest growth rate of 76.84% at tk.216,699,724. The sale and gross profit are high in absolute figures in Rahimafrooz as compared to quasem drycell Limited and the percentage of gross profit to sales has is relatively high (19.229%) compared to the Quasem Drycell limited(18.753%). The cost of sales as a percentage of sales (80.771%) in Rahimafrooz Batteires Limited is relatively low compared to Quasem Drycell Limited (81.247).On the other hand, Rahimafrooz has brought the profitability 19.229% compared to Quasem has 18.753%. Rahimafrooz has Operating expenses and Contribution to WPPF and WF as a percentage of sales (15.869%) ,On the other hand Quasem has operating expenses and Contribution to WPPF and WF as a percentage of sales (13.523%).Gross profit as a high percentage of sales(19.229%) but it is insufficient to recover operating expenses and Contribution to WPPF and WF .That’s why,Net profit before tax is 4.396% of sales on the other hand quasem has net profit before tax is 5.884%. Net profit have decreased both in absolute figures and as a percentage in Rahimafrooz (19,164,748 i,e, 0.736%) as compared to Quasem (40,215,241,i,e, 4.301%). 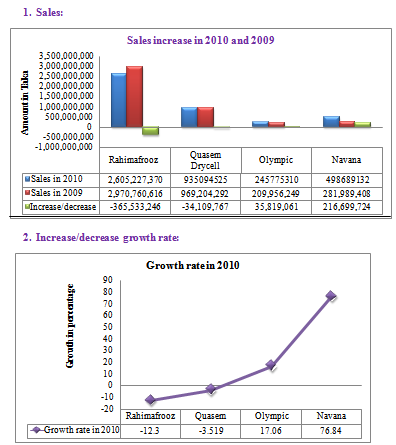 The cost of sales as a percentage of sales (80.771%) in Rahimafrooz Batteires Limited is relatively high compared to Olympic Industries (71.596%).On the other hand, Rahimafrooz has brought poor rate of profitability 19.229% compared to Quasem has 28.404%. 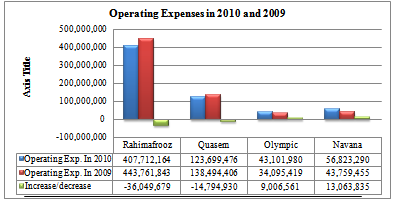 Rahimafrooz has Operating expenses and Contribution to WPPF and WF as a percentage of sales (15.869%) ,On the other hand Olympic has operating expenses and Contribution to WPPF and WF as a percentage of sales (18.073%).Gross profit as a high percentage of sales(19.229%) but it is insufficient to recover operating expenses and Contribution to WPPF and WF .That’s why,Net profit before tax is 4.396% of sales on the other hand Olympic has net profit before tax is 10.729%. 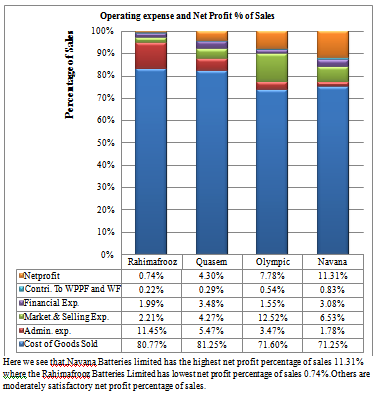 The cost of sales as a percentage of sales (80.771%) in Rahimafrooz Batteires Limited is relatively high compared to Navana Batteries (71.596%).On the other hand, Rahimafrooz has brought poor rate of profitability 19.229% compared to Navana Batteries has 28.404%. Rahimafrooz has Operating expenses and Contribution to WPPF and WF as a percentage of sales (15.869%) ,On the other hand Navana Batteries has operating expenses as a percentage of sales (12.221%).Gross profit as a low percentage of sales(19.229%) so it is insufficient to recover operating expenses and Contribution to WPPF and WF .That’s why,Net profit before tax is 4.396% of sales on the other hand Navana Batteries has net profit before tax is 11.307%. The current assets have increased by Tk. 246,220,543 i.e. 26.071% and cash has increased by 1,065,875 ,i,e,. The current liabilities have increased only by253,712,995 i.e. 28.444% .This further confirms that the company has used long-term finances even for the current assets resulting into an not so much improvement in the liquidity position of the company. No working capital. Noncurrent liabilities increased by . 46,247,417 (72.361%), Current Liabilities increased by Tk. 253,712,995 (28.444%),fixed assets decreased by 67,158,457 (12.982%),Investment is increased by Tk. 106,645,806 (106.635%).So, Company uses the long term and short term sources of financing in taking investment. Total assets is increased by 285,707,892 (18.294% ) where equity portion is decreased by -14,252,521 (-2.352%) and total liabilities is increased by 299,960,412 (31.380%).So, the company is dependent on outside claim too much. The overall financial position of the company is not satisfactory. The comparative balance sheet of the company reveals that during 2010 there has been an decrease in fixed assets of Tk. -6,010,375 i.e. -1.204%, Noncurrent Liabilities to outsiders have relatively decreased by Tk 9,569,146,i,e,( -49.290%)and equity share capital has increased byTk. 9,273,827,i,e,(1.855%). This fact indicates that the policy of the company is to sale fixed assets to meet up the long-term sources of finance and also increases the equity capital of the company. The current assets have increased by Tk. 26,017,488,i.e. 7.422% and cash has increased by 2,280,231,i,e, 33.037%. The current liabilities have increased only by 35,302,432,i.e. 10.647%.This further confirms that the company has used long-term finances even for the current assets resulting into an not so much improvement in the liquidity position of the company.No working capital. Noncurrent liabilities decreased by . -9,569,146 (-49.290%), Current Liabilities increased by Tk. 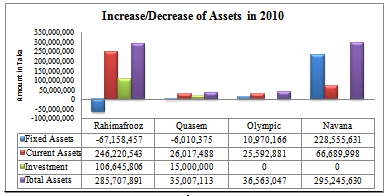 35,302,432 (10.647%),fixed assets decreased by 6,010,375 (-1.204%),Investment is increased by Tk. 15,000,000 (1500.000%).So, Company uses the long term and short term sources of financing in taking investment. Total assets is increased by 35,007,113 (4.114%) where equity portion is increased by 9,273,827 (1.855%) and total liabilities is increased by 25,733,286 (7.332%).So, the company is dependent on outside claim too much. The comparative balance sheet of the company reveals that during 2010 there has been an increase in fixed assets of Tk. 10,970,166 ,i.e. 24.117%.Noncurrent Liabilities to outsiders have relatively increased by Tk 3,283,841,i,e,( 21.631%)and equity share capital has increased byTk. 17,182,171,i,e,( 48.486%). This fact indicates that the policy of the compan is to purchase fixed assets from the long-term equity and debt sources of finance No investment is made. The current assets have increased by Tk. 25,592,881,i.e. 47.271% and cash has increased by 18,763,738,i,e, 116.595%. The current liabilities have increased only by 16,097,035,i.e. 32.844%.This further confirms that the company has used long-term finances even for the current assets resulting into much improvement in the liquidity position of the company. Total assets is increased by 36,563,047 (36.699%) where equity portion is increased by 17,182,171 (48.486%) and total liabilities is increased by 19,380,876 (30.192%).So, the company is dependent on outside claim slightly. The comparative balance sheet of the company reveals that during 2010 there has been an increase in fixed assets of Tk 10,970,166,i.e. 24.117%.Noncurrent Liabilities to outsiders have relatively increased by Tk 3,283,841,i,e,( 21.631%)and equity share capital has increased byTk. 17,182,171,i,e,( 48.486%). This fact indicates that the policy of the company is to purchase fixed assets from the long-term equity and debt sources of finance .No investment is made. Total assets is increased by 36,563,047 (36.699%) where equity portion is increased by 17,182,171 (48.486%) and total liabilities is increased by 19,380,876 (30.192%)So, the company is going to dependent on itself. Rahimafrooz Batteries limited has reduced fixed assets Tk.-67,158,457 and negative growth rate is -12.98%. Company has sold the fixed assets and laid out their money in investments Tk.106,645,806 (106.64%) from noncurrent liabilities increased 72.36% Tk.253,712,995. Quasem Drycell limited has reduced fixed assets Tk. -6,010,375 respectively and negative growth rate is -1.20% .Both company has sold the fixed assets and laid out their money in investments Tk.15,000,000(1500%) from equity funds increased by 9,273,827 (1.86%).They made equity injection. (lowering the debt-equity ratio). Olympic Industries Limited has no investment, they purchasing fixed assets by 10,970,166 with the growth rate of 24.12% from equity increase by 48.49% and noncurrent liability also increased by 21.63% and current liability is 32.84%.It has the highest increased working capital Tk.9,495,846. Navana Batteries Limited have no investment, they purchasing fixed assets by 228,555,631 201.01% from increased current liabilities is 238860938 (219.765%).It is suffering lowest working capital tk.-172,170,940. 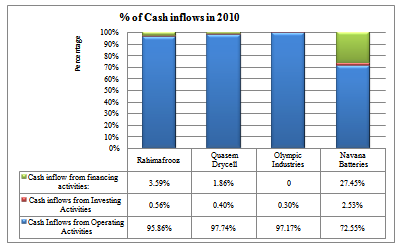 (i) An analysis of pattern of financing of both the companies shows that Quasem Drycell Ltd is more traditionally financed as compared to Rahimafrooz Batteries Ltd. The former company has depended more on its own funds as is shown by balance sheet. Out of total investment, 57.477% of the funds are proprietory funds and outsiders funds account only for 42.523%. In Rahimafrooz Batteries Ltd proprietors’ fund are 32.022% while the share of outsiders funds is 67.978%which shows that this company has depended more upon outsiders funds. (ii) Both the companies are enjoying sufficiency of working capital. 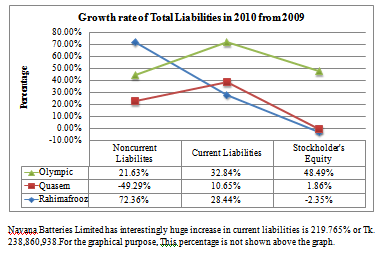 The percentage of current liabilities is more than the percentage of current assets in both the companies. (iii) A close look at the balance sheet shows that investments in fixed assets have been from working capital in both the companies. In Rahimafrooz Batteries Limited fixed assets account for 24.366% of total assets.But it uses the funds of working capital in investment projects(11.186%).While in Quasem Drycell limited fixed assets account for 55.689%,this company purchases more fixed assets from working capital. (iv) Thus, both the companies has moderate level of working capital .So, immediate steps should be taken to issue more capital or raise long term loans to improve working capital position. 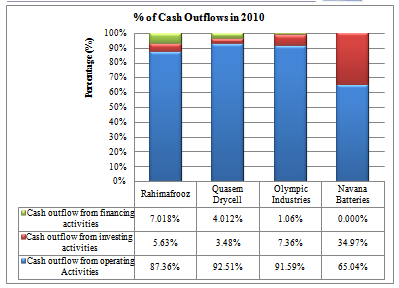 (i) An analysis of pattern of financing of both the companies shows that Olympic Industries Ltd is more traditionally financed as compared to Rahimafrooz Batteries Ltd. The former company has depended more on its own funds as is shown by balance sheet. Out of total investment, 38.636%of the funds are proprietory funds and outsiders funds account only for 61.364%. In Rahimafrooz Batteries Ltd proprietors’ fund are 32.022% while the share of outsiders funds is 67.978% which shows that this company has depended more upon outsiders funds. (ii) Both the companies are enjoying for the sufficiency of working capital. The percentage of current liabilities is more than the percentage of current assets in both the companies.But, Olympic has high percentage of working capital of the total assets(10.739%) where Rahimafrooz Batteries Limited has 2.433% of the total assets. (iii) A close look at the balance sheet shows that investments in fixed assets have been from working capital in both the companies. In Rahimafrooz Batteries Limited fixed assets account for 24.366% of total assets. But it uses the funds of working capital in investment projects(11.186%).While in Olympic Industries limited fixed assets account for 41.455%,this company purchases more fixed assets from working capital. (iv) Thus, both the companies has moderate level of working capital .But,Rahimafrooz has high dependency on outside claim than internal funds.So, immediate steps should be taken to issue more capital or raise long term loans to improve working capital position. (i) An analysis of pattern of financing of both the companies shows that Navana Batteries Ltd is more traditionally financed as compared to Rahimafrooz Batteries Ltd. The former company has depended more on its own funds as is shown by balance sheet. Out of total investment, 40.856% of the funds are proprietory funds and outsiders funds account only for 59.144%.In Rahimafrooz Batteries Ltd proprietors’ fund are 32.022% while the share of outsiders funds is 67.978% which shows that this company has depended more upon outsiders funds. (ii) Rahimafrooz Batteries Limited is enjoying for the sufficiency of working capital. The percentage of current liabilities is more than the percentage of current assets in both the companies.But, Navana Batteries Limited has negative percentage of working capital of the total assets (-17.387%) where Rahimafrooz Batteries Limited has 2.433% of the total assets. (iii) In Rahimafrooz Batteries Limited fixed assets account for 24.366% of total assets. But it uses the funds of working capital in investmentprojects(11.186%).While in Navana Batteries limited fixed assets account for 58.243% this company purchases more fixed assets from equity financing (240,087,382,i,e,40.856%). (iv) Thus, Rahimafrooz Batteries Limited has moderate level of working capital But Navana Batteries Limited has negative working capital.On the other hand,Rahimafrooz has high dependency on outside claim than internal funds. So, immediate steps should be taken to issue more capital or raise long term loans to improve working capital position. Here, we see that Rahimafrooz has highly dependent on external debt equity holding only 32.02% of the total capital structure where Quasem holding the highest dependency on the funds. Rahimafrooz has focused highly in investment and on the other hand Olympic and Navana has also focused highly on investing fixed assets. Rahimafrooz Batteries Limited has decreased its cash inflows from operating activities and cash outflows from operating activities both are decreased. Cash inflow from investing is increased because Rahimafrooz Batteries Limited has invested it in share money market and on the same as the cash inflow from financing activities decreased and cash outflow from financing activities increased. Current Ratio:The current ratio is a commonly used measure of short-run solvency, the ability of a firm to meet its debt requirements as they come due. Current liabilities are used as the denominator of the ratio because they are considered to represent the most urgent debts, requiring retirement within one year or one operating cycle. The available cash resources to satisfy these obligations must come primarily from cash or the conversion to cash of other current assets. Current ratio for Rahimafrooz Batteries Limited indicates that at year-end 2010 current assets covered current liabilities 1.03923 times compared to Quasem Drycell Limited (1.02639 times), Olympic Industries Limited(1.22464 times) and Navana Batteries Limited (0.70602 times). For each taka the firm owes (short-term liabilities), the firm has Tk. 1.03923 in its asset.It is also more compared to the industry average 0.99908.So, the company is highly liquid. Accounts receivable and inventory may not be truly liquid. A firm could have a relatively high current ratio but not be able to meet demands for cash because the accounts receivable are of inferior quality or the inventory is salable only at discounted prices. It is necessary to use other measures of liquidity, including cash flow from operations and other financial ratios that rate the liquidity of specific assets, to supplement the current ratio. 2. Acid test ratio:The quick or acid-test ratio is a more rigorous test of short-run solvency than the current ratio because the numerator eliminates inventory, prepaid expenses considered the least liquid current asset and the most likely source of losses. Like the current ratio and other ratios, there are alternative ways to calculate the quick ratio. Some analysts eliminate prepaid expenses and supplies (if carried as a separate item) from the numerator. The quick ratio for Rahimafrooz Batteries Limited indicates 0.35215 times compared to Quasem Drycell Ltd. holds 0.17978 times,Navana Batteries Limited holds 0.294811 times .But Olympic Industries Limited has 0.55617 times greater than Rahimafrooz Batteries Limited. Rahimafrooz Batteries Limited has also more times compared to the industry average 0. 34573 times .So, the company is highly liquid. Rahimafrooz Batteries Limited has the highest net working capital ratio (0.0243310 times) compared to Quasem Drycell Limited (0.0109325 times), Olympic Industries Limited (-0.1073930) and Navana Batteries Limited (-0.0243310).The company also has more Net Working Capital Ratio times compared to the industry average -0.0078028. So, having enough working capital with respect to total assets, the company’s performance and the liquidity position is good. For measuring short-term solvency is the cash flow liquidity ratio which considers cash flow from operating activities (from the statement of cash flows).The cash flow liquidity ratio uses in the numerator, as an approximation of cash resources, cash and marketable securities, which are truly liquid current assets, and cash flow from operating activities, which represents the amount of cash generated from the firm’s operations, such as the ability to sell inventory and collect the cash.